Thanks to vocal fan support, this book has become a reality. 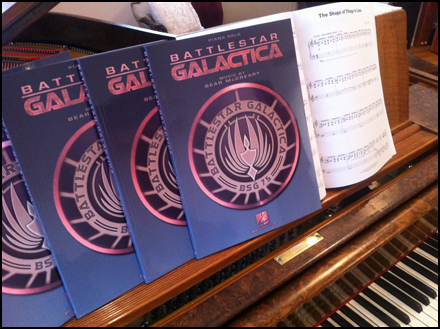 The BSG piano book stands apart from other piano arrangement collections. Very few soundtrack piano books were arranged by the original composer, but I wanted to ensure the ideal translation from orchestral score to solo piano, so I personally arranged each selection. I’m too much of a perfectionist to let anybody else do this! I first got the idea when I was composing the piano-centric score for Someone to Watch Over Me. 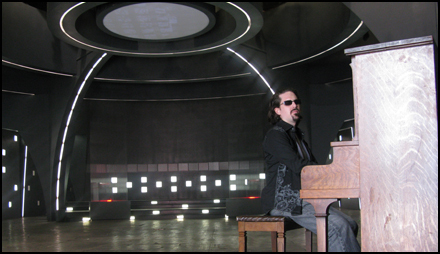 The solo piano pieces featured in that episode, notably “Dreilide Thrace Sonata No. 1” and “Elegy,” are among the strongest compositions I ever created for the series. 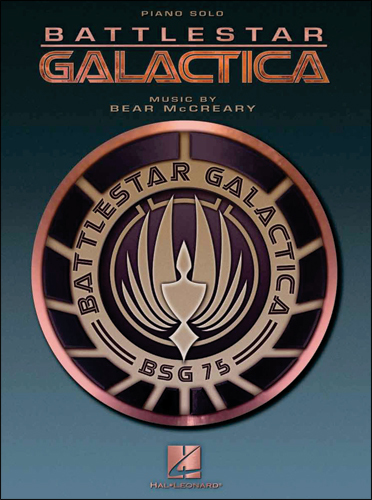 My original plan was to put out sheet music of just those cues, combined with “Battlestar Sonatica.” However, as I prepared them for publication, I realized many other “BSG” compositions would also translate well to piano. At last, you guys can now be a part of the musical process yourselves and experience the score as I first did: with fingertips touching the ivories. I get a geeky chill thinking about fans around the world tinkering through “Wander My Friends,” or ripping through the virtuosic “Dreilide Thrace.” Even if you’re not an accomplished pianist, you’ll still be able to play through the layered inner lines that make “Passacaglia” so lyrical, and explore all the nuances in the music on your own. I’m most excited about “Kara Remembers,” because it’s for two players. One person plays the role of Slick and the other plays Kara. When played together, this track recreates exactly what I wrote for the actors on set. Note for note, you’ll be able to perform the entire scene! I’ve already seen many people on YouTube sit at their pianos or guitars and play through the music of “Battlestar Galactica.” With this book coming out in a few weeks, I want to see that number multiply. Once you get your book and learn a piece, put a video of it online and link to it here in the comments. I want to see them! I may even do a couple myself. And help spread the word to other fans and musicians alike. If this sells well, a collection of Caprica or Human Target music could be possible. Look what just showed up in my mail box! You guys let me know when yours arrive too. Shipping got a little delayed, but the books are now getting out there into the world. Now, it’s time for me to start practicing again. I just played through a few on my piano and they sound great. So Say We All!